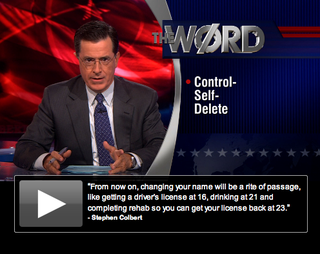 The Colbert Report set its sights last night on internet privacy—skewering CEO Eric Schmidt, especially, for saying we'll all need name changes someday. The segment targets online privacy, generally, but hinges mostly on Google (with a smattering of Facebook thrown in for good measure). It also comes not long after Jon Stewart's net neutrality diatribe on The Daily Show last week. If nothing else, it's just nice to see that online privacy apprehensions have seeped into the general consciousness in a major way.